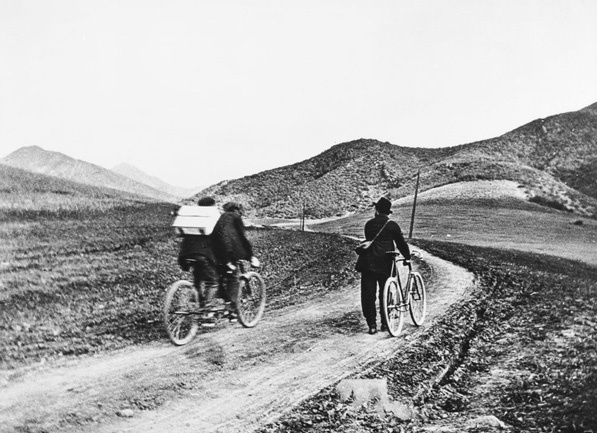 Los Angeles public TV station KCET presents A Brief History of Bicycles in the Los Angeles Area on their blog. For everyone interested in bicycles or LA history–or both!–the article includes some wonderful photos of a bike-friendly LA from a century ago. Seeking to capitalize on popular interest in the sport, the Southern Pacific Railroad built a bicycle track and spectator stand in the beach community. The Santa Monica Cycle Path to Los Angeles was later built along the present-day route of Washington Boulevard. Good timing on the blog post, KCET: tonight is the Hammer Museum’s 3rd annual Bike Night.